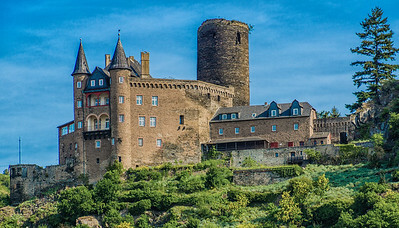 Include in this gallery are images of many important medieval fortresses, castles and palaces on the Rhine river. 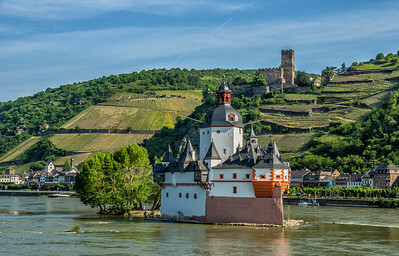 Between Bingen and Bonn, Germany, the Rhine River flows as the Middle Rhine providing views of the fortification system that dominates the Rhine Valley to this day. 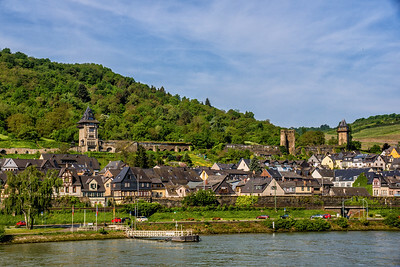 ​Oberwesel lies on the Rhine River west bank in the Rhine Gorge, a UNESCO World Heritage Site, between the neighboring towns of Sankt Gore and Bacharach. The town wall which was built in the early 13th century has some sections open to the public. It was expanded and strengthened in the 14th century, with 16 defensive towers. It is considered the best preserved girding wall anywhere on the Rhine Gorge. 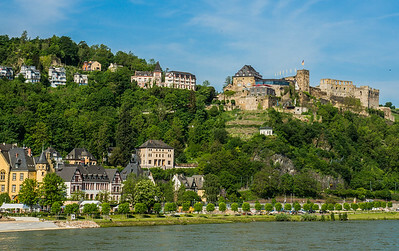 Sankt Goarshausen is centrally located not far from the legendary Loreley rock.The city is connected to its sister city Sankt Goar by the Loreley ferry, so that various possibilities are offered here for an active and recreational holiday in the Upper Middle Rhine Vally World Heritage. ​Count Wilhelm II. 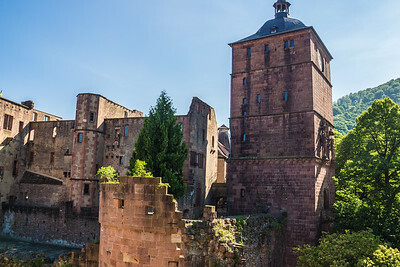 of Katzenelnbogen built the Katz Castle in the second half of the 14th century. 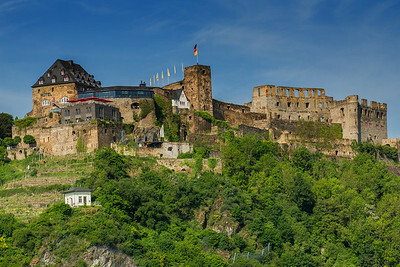 Katz Castle was used as bastion and military base to protect the Rheinfels Castle. Together they formed a fortified bulwark with a barrier for levying of the Rhine toll. The extended view up to the bend of the river at the Lorely was also of great importance to secure salmon fishing. 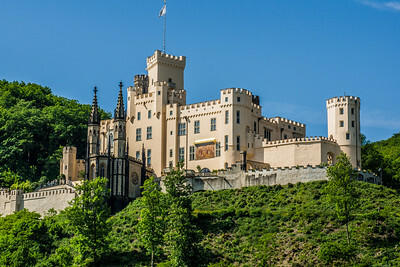 Due to the intentionally chosen location on the mountain ridge, Katz Castle could not possibly be conquered from the Middle Rhine valley in Germany. ​Sankt Goar is a town on the west bank of the Middle Rhine in the Rhein-Hunsrück-Kreis in Rhineland-Palatinate, Germany. 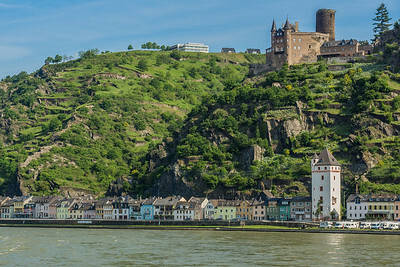 It belongs to the Verbandsgemeinde of Sankt Goar-Oberwesel, whose seat is in the town of Oberwesel. 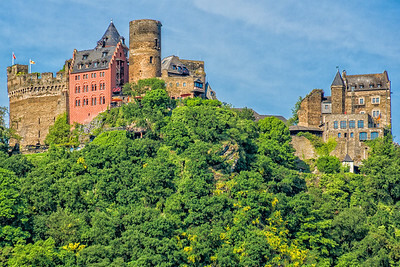 ​Stolzenfels Castle is a castle or palace near Koblenz on the west bank of the Rhine, in the state of Rhineland-Palatinate, Germany. Stolzenfels was a ruined 13th-century castle, gifted to the Prussian Crown prince, Frederick William in 1823. He had it rebuilt as a 19th-century palace in Gothic Revival Style. Today, it is part of the UNESCO World Heritage Site Upper Middle Rhine Valley.